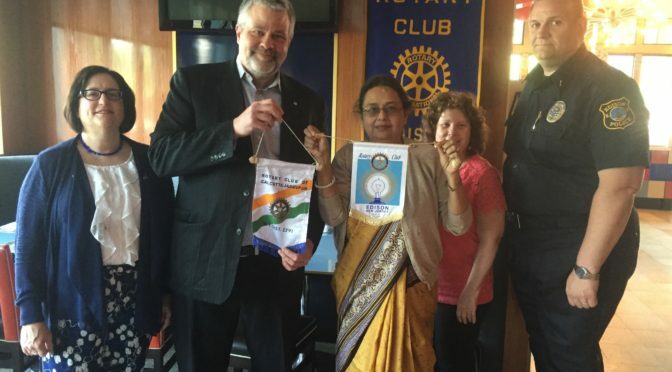 The Edison Rotary Club welcomed Santasree Mazumder, President-Elect of the Rotary Club of Calcutta Jadavpur. She and Richard Phelan, President-Elect of the Edison Rotary Club exchanged club flags. Santasree shared some information with us about her club and their projects which include building surgical facilities, supporting education for girls and sanitation projects. We are planning to hold a joint meeting via Skype to discuss the possibilities of partnering on a Global Grant from the Rotary Foundation.